What a nice month to be flying RC aircraft! Just a touch of precipitation, but not enough to ruin your day and the winds were generally right down the runway. We definitely fared better than the rest of the country. After just 2 weeks of locking the porta potty there has been a very noticeable change in overall cleanliness. I had just assumed some of us were slobs and others were just plain nasty. NICE Surprise! It was the general public that see our unit from the road and blow in at 50 miles per hour!! We also received permission from the vendor to camouflage the unit again to make it less visible from the street. Jim (Picasso) did the spray out and I know it really helped to keep unnecessary traffic down the last 2 weekends. The porta potty lock is keyed to match the gate, so please ensure you have your key with you. Keys can be purchased on site for $3.00 (our cost) from myself, Randy, and Dennis LaBerge. PLEASE, PLEASE, and in case I didn’t say it yet, Please – if you are the last member leaving the site – close and lock the gate behind you. If there are random vehicles there, knock on the window and inform them that the site is being locked. If there are empty vehicles there, lock the gate- they will figure it out. Part of our agreement with the city is that ALL people flying aircraft at our site will be insured (AMA), and will be versed and monitored for correct safety practices (SEFSD Membership with safety officer). Randy and I stayed late a few weeks ago and were surprised at the number of people that rolled in to the runway and rotorplex area late afternoon that stated they always come late when no one else is around and the gate is open. Even though it is posted at the main gate, at every flying gate at the runway, and at the rotorplex the AMA and SEFSD membership is required – they all “Magically” didn’t know about any such requirement. Again – close the gate upon exiting. We are approaching 330 members for 2018. Still a bit behind last year, but I am thinking that may be because some prior members still have not renewed for this year. In the last couple of weeks Jim, Randy, and I have approached quite a few people (flying) that stated they thought they had renewed ( but had not) and people that claimed they had paid for a 2 year membership. We only did that in 2015, and those expired in 2016. Please continue to wear your badges while flying so we know you are a member. Members – please continue to ask people not wearing badges to show you their badge. If they are a prior member, Guest privileges do not apply and they need to join the club before they continue flying (they can join from their phone on the spot of their AMA is up to date) If they have never been a SEFSD member and are visiting (with AMA) we will let them fly as our guest up to 3 days before asking them to join our club. They are required to sign the guest log and a member must brief them on our safety practices and observe a flight to ensure the person is not a menace. As we pass Memorial Day, a lot of people are setting up their back yards for the summer events and parties to come. As you look at your yard furniture from last from previous summers and you contemplate replacing things – we are always accepting donations of used chairs, and even umbrellas. Last year Ray and I each donated $100.00 to purchase 10 chairs from Home Depot, only 2 of those remain. The Good Time Race League will be kicking off their summer race series at our rotor plex area this weekend. Drone racing is a lot of fun to watch, and for those on the fence – this may be your chance to see what it is all about. I ask that all plane pilots be extra vigilant to carry our fence line out in an imaginary line towards Friars road, and not cross that line. 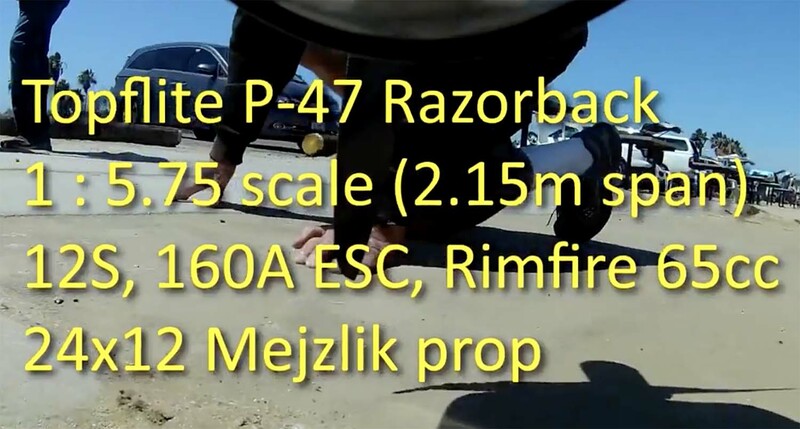 This will keep you from flying over people at the rotor plex area. 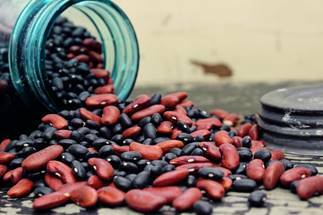 Our monthly fun fly event is the extremely popular “Don’t spill the beans!” event which will start at 10:00 A.M. Saturday the 26th to be followed by the monthly meeting and our customary hot dog lunch for members. You can win CASH MONEY! Beans, and holder device provided. Take off, climb 100ft, perform loop or roll and land. You get 20 beans, and each bean is worth $1. Quan your treasurer, has lost his beans and will buy each bean back for $1.00 each after your flight! He only wants beans that have flown! $150 in Cash awarded to top winners! Club meeting, and Lunch to follow. 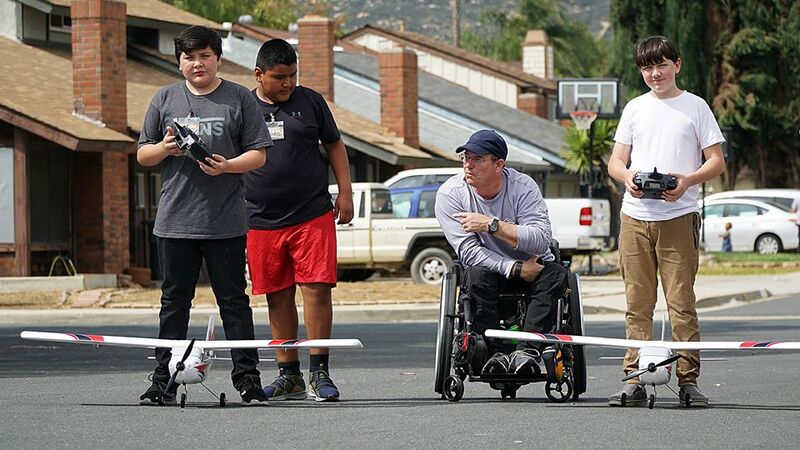 Our friend, Steve Scott, has started a non profit based mentoring activity called Project RC Pilot. 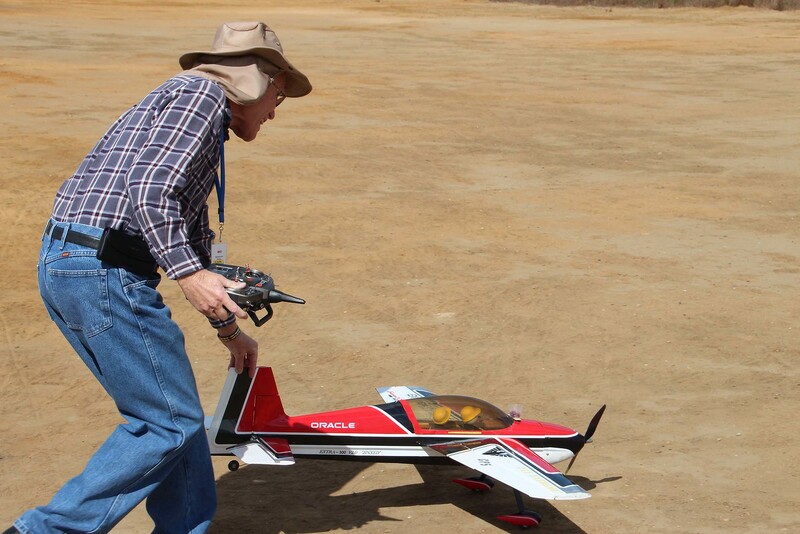 This is for low income children to have the opportunity to build and fly R/C aircraft. This is a great chance for these kids to get involved in our hobby when they would not otherwise be able to because of the cost. So far the Project has been a success. Steve is also demonstrating Drone skills required for a job as well. Donations are needed to really get this Project moving! If you can, please help. Click the pic for Mark Davis’ P-47 flight. Click the pic for all the pics from the event. Jerry Neuberger has a cool new toy: The CG Wizard! Have you ever tried to check the CG of a large airplane? It can be a challenge. With the CG Wizard it is easy and accurate. 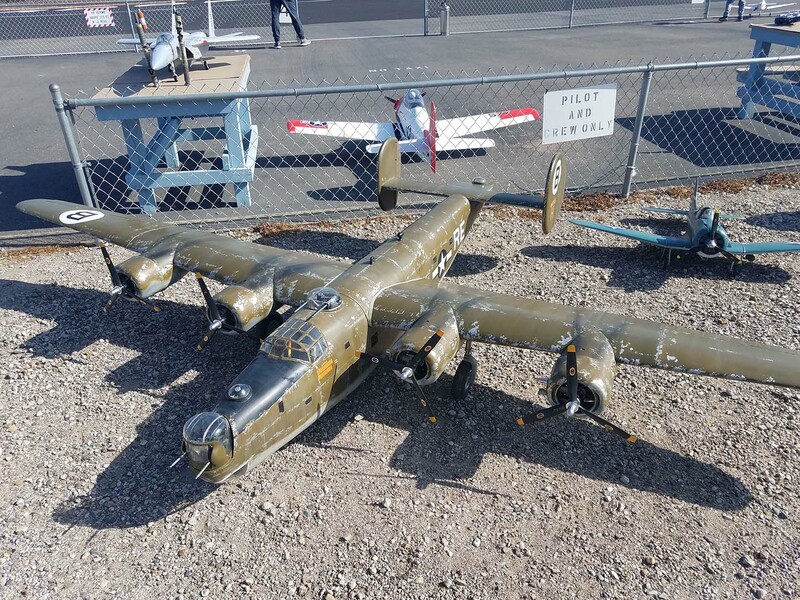 The huge B-17 shown is in Frank Gagliardi’s garage. It sits atop a large table on the CG Wizard’s three digital weight sensors, one for each wheel. Those weights along with some careful measurements gives you the CG location. More details of the procedure are shown below in the pictures. Click the pic for the article. 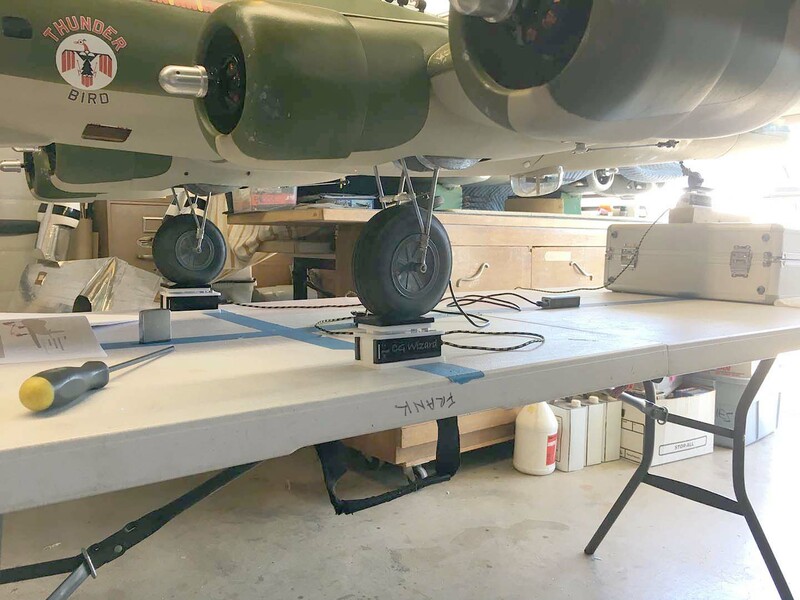 Note from the editor – The above article is excellent but to avoid asymmetric thrust due to one motor quitting there are a few things I do when I set up a twin: (1) The low voltage cutoff in the ESC is there to save your Li-Po from over-discharging. This is at the expense of your plane. In a single engine plane you can usually glide and land after it kicks in. On a twin you will probably see one ESC go into LVC before the other. This will give full power to one motor and no power to the other. If this happens on climb-out you will be astonished how fast your plane can screw into the ground. I program the low voltage cutoffs in the ESCs so they will not cut off until the battery voltage is below 2 – 2.5V per cell. This saves the plane at the expense of the battery. Most of us rarely fly into the cutoff anyway. Know your plane and do not fly too long. (2) The ESCs I use also have over-current protection. The ESC will cut off if the current is too high. Naturally, this would happen to one ESC first thereby causing asymmetric thrust and your plane will perform a “helix” maneuver into the ground. Since it is an over-current protector it would most likely happen during climb-out. I turn off the over-current protection on my twins’ ESCs. If you have done your setup correctly, and tested the current at full throttle afterward, you will never need the protection anyway. (3) I use an RX battery or UBEC rather that depend on one of the ESCs for radio power. 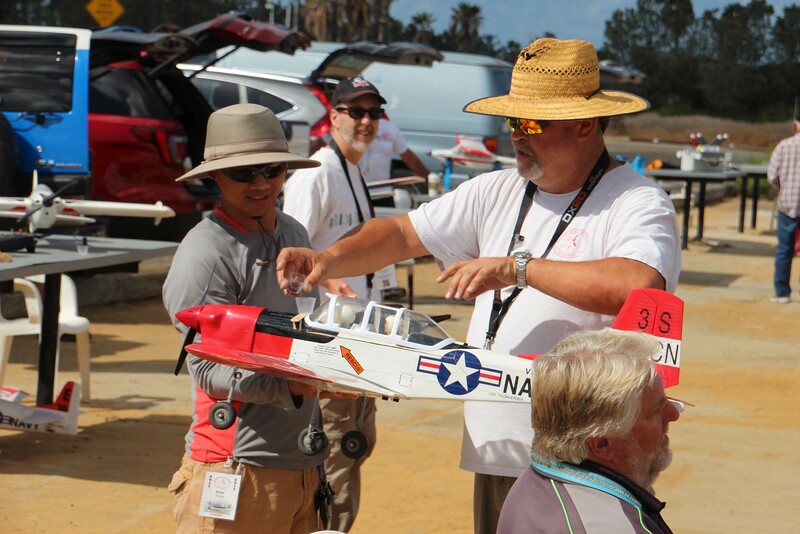 Wing Cube Loading (WCL) provides a comparative value which can be used as an indicator, or a rule of thumb, for grouping radio controlled, miniature, aircraft by similar flight characteristics and “flyability”. As Mr. Reynolds notes in his article, some people feel that it is a better “flyability” indicator than wing area loading (WAL) expressed in oz./sq.ft. of wing area. The WCL comparative value, or even WAL, has little to do with the aerodynamics needed to get the model to fly at various sizes/scales in real, un-scaleable air. 1. 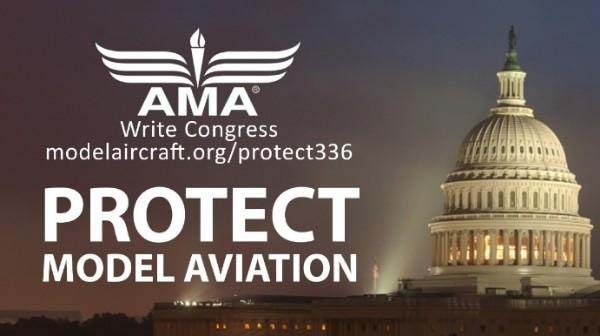 Share AMA’s Facebook and Twitter posts to contact their legislators. 2. Forward this email to your club member list, in case our membership records do not contain a person’s most current email address or as a reminder to those that have not yet contacted their representatives. 3. Mention this campaign at the flying site and during your next meeting to your members that may not utilize email or social media.